In India's north-eastern state of Assam, groups of tame elephants, called kunkis, are being used to control the excesses of their wild cousins. Marauding wild herds cause mayhem and a number of deaths every year. Now more than 200 "raids", putting tame elephants in the path of wild herds to get them to back off, have been conducted by expert handlers. In one badly affected district where the tactic was first tried, the number of deaths has been halved. The unique tactic has been perfected as part of a human-elephant conflict-mitigation strategy. Forest officials track the movement of the herds of wild elephants and the kunkis then proceed to the area that is threatened. The tamed elephants are driven into place by expert handlers, or mahouts. The scheme comes under the North Bank Landscape Project of the World Wildlife Fund (WWF). The tactic was first introduced and developed in Assam's Sonitpur district on the north bank of Brahmaputra river. Between 25 and 30 people have lost their lives to wild elephants in Sonitpur every year since 2000. District officials there say after the kunkis were introduced last year, fewer than 15 people have died. Ten wild elephants have been hunted down and killed during the period, they said. 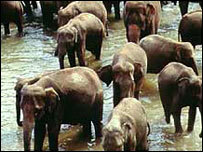 The kunkis or tame elephants form the core of the "anti-depredation" squads, which have been formed by the Assam forest department, supported by the WWF. Assam's forestry minister, Pradyut Bordoloi, said 50 anti-depredation units had been set up with forestry officials, mahouts and equipment such as searchlights and sound generators. Previously wildlife experts had tried tripwires and "red chilli bombs" to keep wild elephants away from villages.